Network/Phone Cable Installation - Inner Net Inc. The base for any solid network, phone, or camera system is the cable infrastructure installation. Connection, bandwidth, and continuity issues are the hallmark of bad network cable installation. 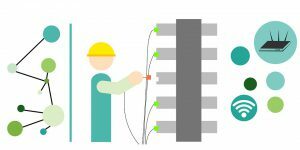 At Inner-Net we believe that a good cable backbone is the first step to achieving great performance across your network. Therefore, we provide our customers with cable installation professionals to make sure that our cable installation job adds to the performance of your network. We will travel to your location to measure what is needed and provide you with quote for a complete cable solution for your project.